Description: Creates a description based reference set from the reference set members. It contains all descriptions of the members in the original reference set. Relationship: Creates a relationship based reference set from the reference set members. It contains all relationships that exist between the members of the original reference set. For example, if a parent concept and its child concept are both members of the original reference set, the derived reference set will contain a member for this relationship. This relationship will be comprised of two concepts, and the relationship type (is a). Duo: Create two reference sets, one description based, and one relationship based. Right-click on the simple-type reference set that you want to use, and select Derive to simple type reference set from the context menu. Enter a name for the new reference set and select one of the options, hit Finish. You can open the new reference set from the reference set view. The screenshot below shows a reference set that was derived from the Cardiology reference set. The concept IDs of the referenced components are displayed. 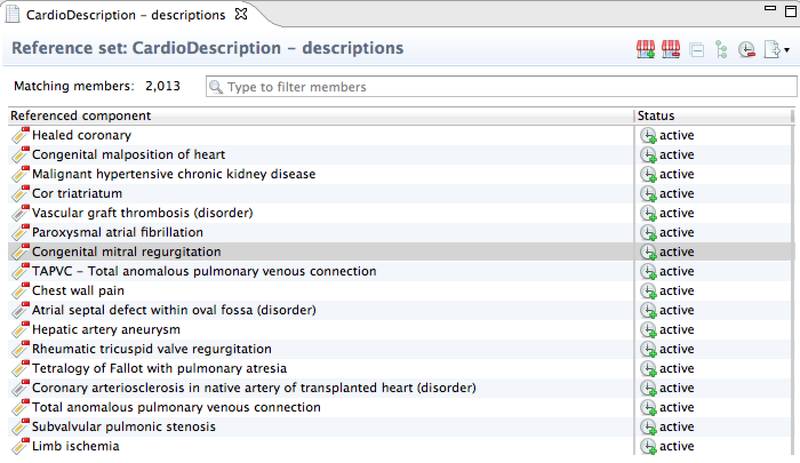 The screenshot below shows a reference set that contains all descriptions of the Cardiology reference set. The SNOMED CT components in a simple type map can be used to create a new reference set. Right-click on the simple map set that you want to use, and select Derive to simple type reference set from the context menu. Enter a name for the new reference set and select one of the options, hit Finish. 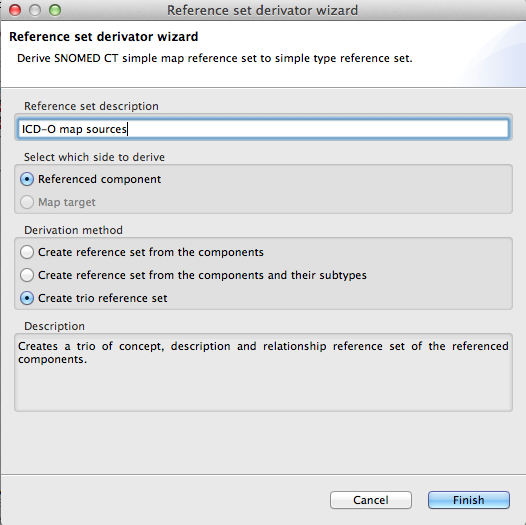 There are three different options for deriving reference sets from simple maps: Components, Components and subtypes, and Trio. The screenshot below shows the original simple map. Components: Creates a reference set with the SNOMED CT concepts that are referenced in the simple map. 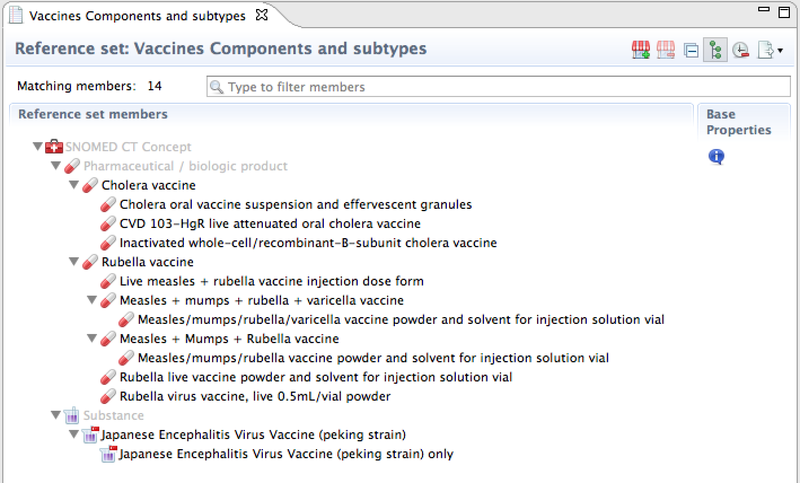 Components and subtypes: Creates a reference set with the SNOMED CT concepts that are referenced in the simple map. In addition to the actual referenced components in the mapping, all of the subtypes of these concepts are also included. This is also referred to as transitive closure reference set from mapping. Trio: Creates three reference sets. 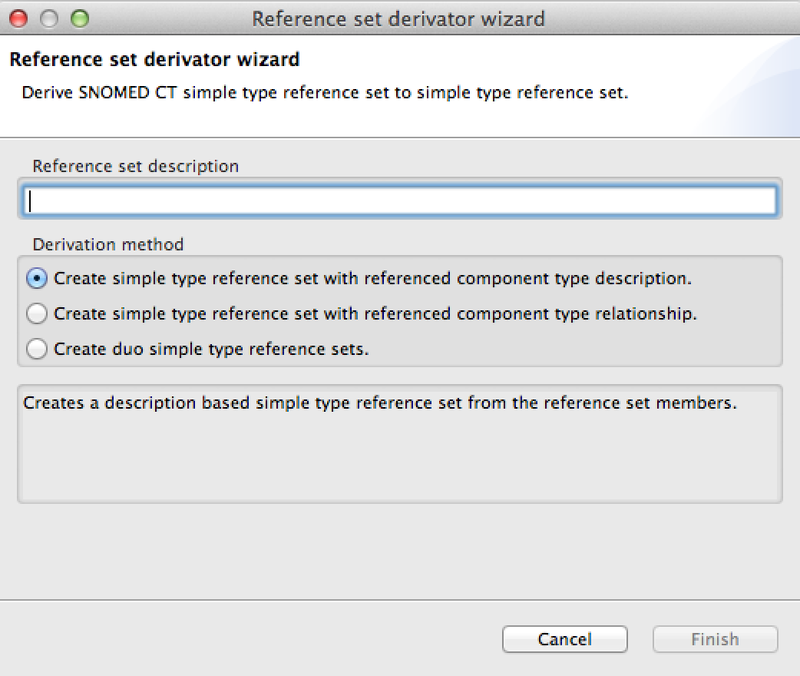 The ‘description reference set’ contains all descriptions of the SNOMED CT concepts that are referenced in the map. "Descriptions" is added to the name (e.g. Vaccine trio - description). The icon decorator indicates that it contains descriptions. The ‘relationship reference set’ is comprised of the relationships that exist between the SNOMED CT concepts that are referenced in the map. Relationships is added to the name of the new reference set (e.g. Vaccine trio - relationships). The icon decorator indicates that it contains relationships.